That is until my husband suggested we take a quick trip to Springfield (it's about an hour) last Friday to grab a book that he wanted. I know you're re-reading that sentence, aren't you? We definitely have book stores here in town, but we have to drive to Springfield or Rogers, AR to shop at Mardel or Lifeway. Anyway, back to the good part...the fabric. 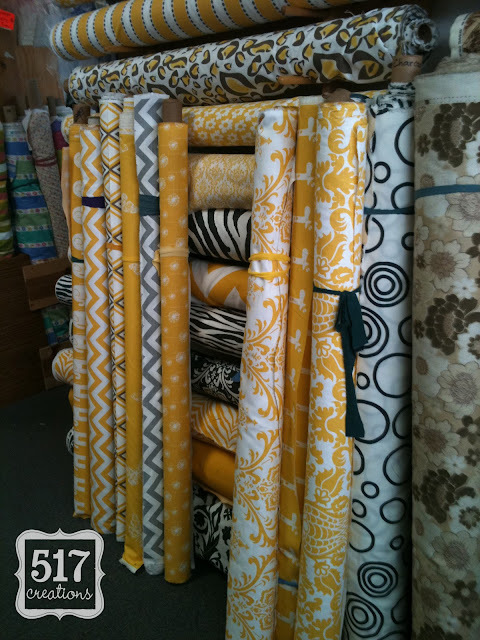 Premier Prints fabric in the oh.so.popular yellow and gray colorways....there is that gray chevron that's popping up all over the blogs. More Premier Prints in navy and white. Don't you love those stars? And even more Premier Prints...they had every colorway offered of Premier Prints. Blues, greens, black/white, gray/purple, etc. It was fabulous. I texted my husband the minute I picked my chin up off of the ground and said "I've died and gone to fabric heaven...seriously." Not only was there an incredible amount of fabric but the prices were RIDICULOUS! 54" wide fabric for WAY less than you can find it online. I couldn't believe it. This was just one room of the store. The rest of the store was packed FULL of tons of 100% cotton solids (for $3.99 a yard! ), chenilles, miles and miles of trims, zippers for $0.25, and lots, lots more. There are some crazy things in the store (weird fake flowers and "grandma" clothes for sale) but it adds to the eccentricity of the store. 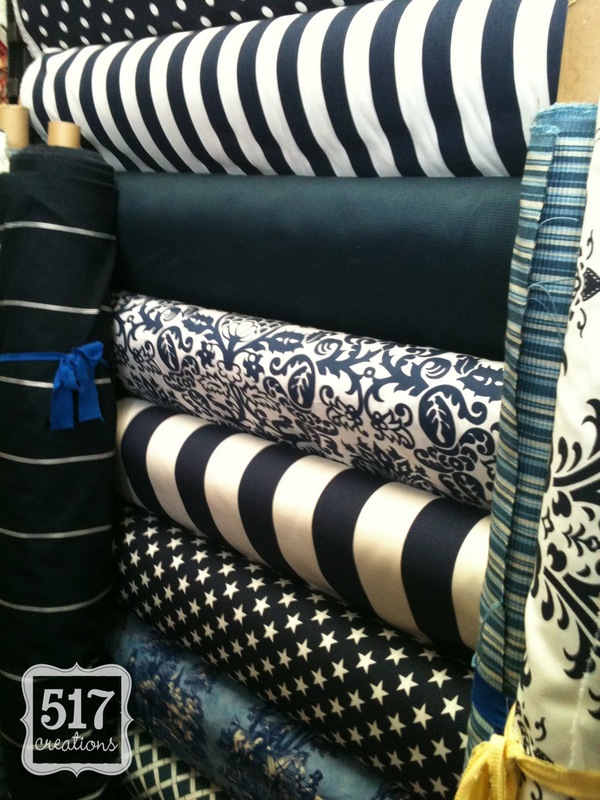 If you're ever near Springfield, Missouri, be sure to schedule a stop at FM Fabrics. If anyone needs any great Premier Prints fabric at a steal of a deal, let me know! 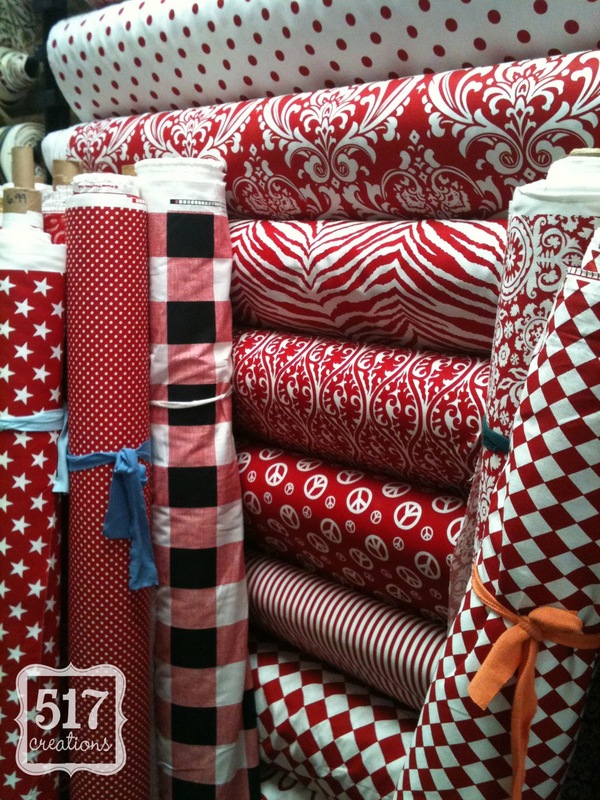 Do you have any great "hole in the wall" fabric stores in your town? Don't you love when a store lives up to its hype!! Or when you find a genuinely good deal. Maybe I lead a boring life (I know I lead a boring life) - but I find genuine enjoyment in such things. I could spend hours wandering through fabric stores - and I don't even know how to sew! Wow I would die! I am going to Memphis this weekend to visit a friend and we are going to the Premiere Prints store. I can't wait!